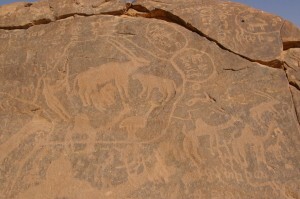 The rock art of the Arabian Desert is extraordinary for its preservation and changing themes through time. This project aims to examine the depicted animal species, which provide an indirect record of the local environment while also capturing cultural elements such as the engravers’ perception of animals and landscape. In addition, variations in rock art styles and inscriptions can be used to determine the degree to which peoples were geographically connected or isolated. The content and spatial distribution of the rock art will show how the relationship of the prehistoric populations with their environment changed over time and whether populations were managing environmental risks through broad communication systems and exchange networks. Examination of rock art images will also provide information on changing trends in subsistence practices.